I don't know who is responsible for deciding which games make it onto the weekly Nintendo Download list, but whoever it is deserves a raise, as long as they keep packing it with games like Kirby's Pinball Land, Frogger: Hyper Arcade Edition and Sweet Memories - Blackjack, a game about playing cards and discovering true love. You run a blackjack club which caters to Japanese school girls. Actually, that's all I have to say about Sweet Memories - Blackjack. It's all I should have to say. So, how about that Frogger: Hyper Arcade Edition? It's got sprites from other Konami classics in it! Did I mention you run a blackjack club for high school girls? Oh, I did. Nevermind. Speaking of high school girls, there's a free Big Time Rush video coming out tomorrow, and someday the people that care will be high school girls! I should probably just shut up and buy the blackjack game. Originally released in 1996, this is the third installment in The King of Fighters game series. The series features an SNK all-star lineup, with characters from games like Fatal Fury, Ikari Warriors, Psycho Soldier and Art of Fighting competing with each other for the title of the world's strongest fighter. This installment adds some major systematic changes compared with previous titles. It features small, medium and big jumps, as well as forward and backward flip emergency escapes. It also adds the extra element of guarding in midair. Being able to review commands makes moves easier to execute, and projectiles have been toned down. This title got rid of the idea of projectile spamming as an effective approach, and it marked a major turning point in the series. Jump into the action with classic and brand-new game modes like Tile Capture, Battle Royale, Freak Out and more that expand the challenge of Frogger's style of run-and-dodge gameplay. Customize your game experience through a variety of different skins, from the modern neon style of HYPER ARCADE to the 8-bit sprites from Frogger, Castlevania and even CONTRA! Throw down against friends or the CPU in up to 4 player matches to find out who's really the top frog! The answer is simple; to change the world! And that's exactly what you get to do in this game! You play as a cute Koala named Ace who loves fruit! Unfortunately a few delicious pieces of fruit are just out of reach and you need to change the positions of the platforms to get to the fruit! You can change the positions of the platform by entering a math formula. There's no right or wrong answer, every formula the player can come up with will have an effect on the world! Suddenly math becomes as fun as drawing! There are many possible ways to finish a level... be creative! Sparky has been entrusted to bring the light to the Crayon Castle before nightfall. The castle is so packed with candles that without your help he'll never make it in time! Lead Sparky through over 100 colorful levels to collect matches and light candles. Use your stylus to select a target, and the little guy will move to it using the shortest route. Time is of the essence so there is a limited number of commands you can issue for each level! As you progress through the levels you will discover many secrets. Don't be surprised to find bombs, puddles, treasures, or even dynamite! Want to try something out of ordinary? Launch rockets filled with matches into space in a bonus mode. This unique, beautiful game for causal gamers will light a fire in the heart of every puzzle fan! Sweet Memories Blackjack is a card game that allows you to play blackjack with a number of different girls. These Japanese high school girls are both cute and sweet additions to the poker club you've created. One day, an old neighbor name Kasumi enrolled at your school, after moving back to the city. Your parents are acquaintances, so she gained the approval of staying at your home during enrollment. You have sweet childhood memories of the time spent with her. Simply face your friend, and the memories will return. 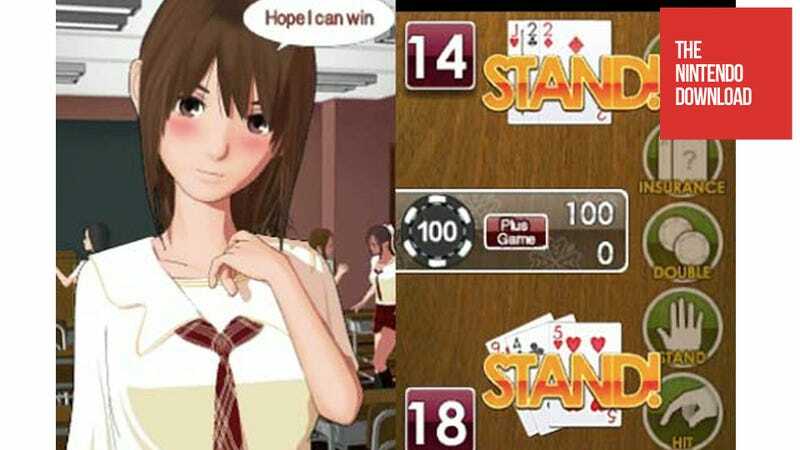 The time you spend playing blackjack together, increases the connection between the two of you, and you will find out that she is the perfect match for you. The future of Riccar is in the hands of Prince Theo and his friends. The Sword of Hope II is a role-playing game that was originally released in 1996 for the hand-held Game Boy system. Take on the role of young Prince Theo of Riccar and embark on a mission to find the truth behind a mystery that is threatening the kingdom. The key to solving the numerous puzzles and gimmicks is the use of commands like "look," "open" and "hit." You'll encounter many places and items during the adventure, plus some friends waiting to lend a hand along the way. Discover worlds of pinball fun in the palm of your hand. Choose your world and take aim. Kirby will be launched into the fast-paced dangers of uncharted worlds, but you can help him face his foes head on. It's a pinball race to check out each new world's surprise enemies and pitfalls. Flip Kirby in battles against lethal eyeballs, a shooting tree and mace-swinging maniacs. Play three different pinball games, each four screens tall, with tons of secret bonus levels. Conceived by Carlos Pena, this video, filmed in Maui showcases an action packed day in BTR's life. A beautiful landscape and sneak peek at the adventures they get up to, makes this video unmissable!